Rolling Tales reaches Asia – Go Bicycle Touring! Take one journalist, combine with an IT Specialist, put them on bikes and what you get is an awesome bicycle touring website. New Zealanders Emma and Justin have traded in high powered jobs in London for a saner pace of life on the bike of a bike. Their site, Rolling Tales, chronicles their open-ended bicycle tour from Europe heading east in search of adventure. In the first village we come to we stop at a cattle trough to give the bicycles a good clean. An elderly man comes out to watch us for a bit and we realise that we’re working in his driveway. A little later a women passes carrying a barrowful of empty water bottles. We wave and say ‘Merhaba’ and she comes over to me, presenting a handful of tomatoes. We’re almost finished our chores when another man comes to say hello and invites us to visit his house up the road. I go to the road to see where he is pointing and see the tomato-gifting woman – his wife. We wheel our bicycles into their courtyard and climb a homemade ladder to a balcony where we’re fed melted cheese sandwiches and fresh tomato and cucumber salad while playing with their cat. They take us for a tour of their garden and larder, proudly showing us a huge cucumber before loading us up with more tomatoes, small green chillies and grapes. Its after we’ve left these kind strangers that we notice the name of the village and realise after months of careful navigation, we’ve taken a spectacularly wrong turn. The helpful Gear Page is well organized and there’s even a section explaining the thought process behind each equipment choice. Another interesting section is Where we Sleep. This is where you’ll find photos of most of their campsites linked to a Google Map. Beware, the Photo Galleries will make you start itching to hit the road. Rolling Tales has been on the road since March 2010. Currently they’re taking a six month breather in Istanbul before continuing their cycle tour through Asia. 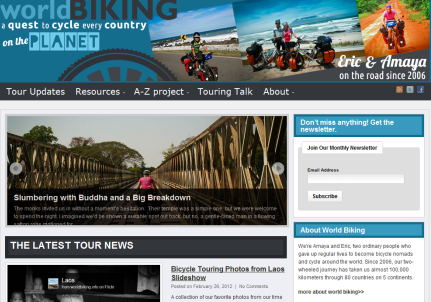 Don’t worry, the blog will continue to be updated regularly with helpful bike touring resources.